A genuine “made in Mexico” artisan/hand-painted product from start to finish! Shipped expediently from our hands to yours. Looking for Special, Traditional - Mexican Favors? 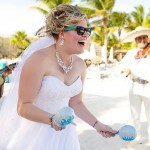 The maracas arrived at Moon Palace resort in Cancun on time & they were a HUGE hit at the reception! We ordered one per guest & my only regret is that I didn't order more because guests all wanted to take more home! Thank you so much! 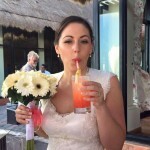 They were so fun during the reception & also added extra, personalized decoration! Thanks for being so easy to work with, too! 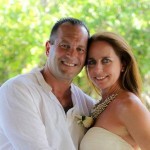 Thanks to Blanca & Omar at Maracas Mexico for a very professional service. 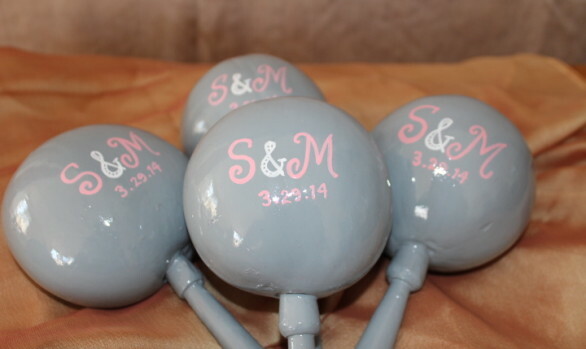 We were so pleased with our finished maracas and they matched our wedding colour theme perfectly. 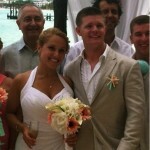 I would definitely recommend your service to any friends getting married in Mexico in the future. What a wonderful family to do business with. Muchas gracias. 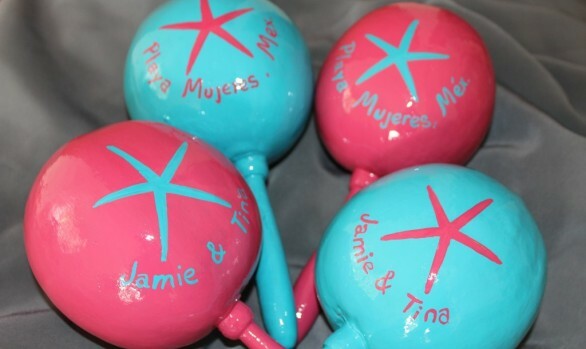 Thank you for our beautiful maracas! They were a huge hit! I remember how crazy the wedding planning was. 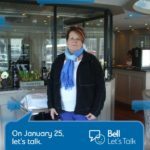 Having vendors like you made the process so much easier! You guys are awesome! 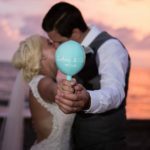 No tienes idea cuánto disfrutaron nuestros invitados las hermosas maracas el día de la boda! ¡Muchísimas gracias por el gran, gran servicio que nos ofrecieron!Nuestro día no hubiera estado completo sin el toque que su trabajo le dio a nuestra noche mexicana! hola blanca, ¡aquí estamos! mil gracias por todo ... caminamos desde el hotel hasta el restaurante con los mariachis (y las maracas, por supuesto) en la quinta avenida ... ¡una noche fantástica! Thank you Blanca!! 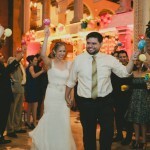 Julie and John loved their maracas! They were a hit with the guests as always. Thank you so much to you guys. 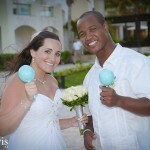 The maracas were beautiful and added the perfect touch to Charisma and Eric's wedding!! 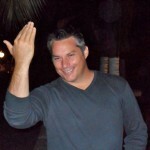 I have worked with Maracas Mexico many times and let me tell you that they are.......... Wonderful!! Book with confidence and joy. 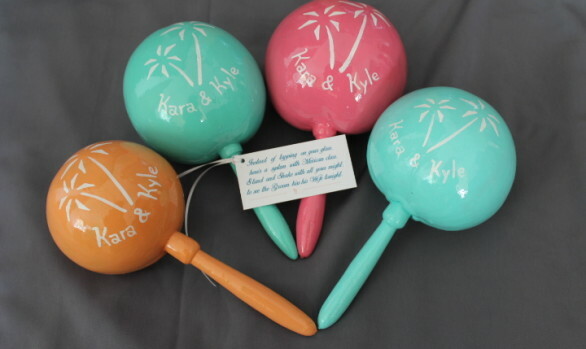 Your guests will love the sound of the Cha ca cha ca and they keep them as a souvenir !! Everyone LOVED them, and the colors were perfect for the beach. Thank you so much, we should have done so much more with you guys and you both were so sweet! We love them! They looked incredible on the table and in our pictures!!! Thanks so much! So lovely meeting you! Thanks Omar and Blanca! We absolutely loved our maracas! They were a huge hit with all of the guests - both young and old! 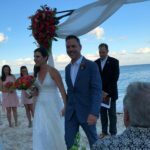 We highly recommend Maracas Mexico for any couple doing a destination wedding or Caribean themed wedding - you both were amazing to deal with and the whole process was stress- and hassle-free. Thank you for helping making our wedding perfect! We are in Mexico!!! And the weather is amazing just like you promised. 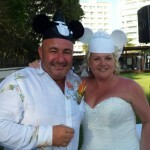 We had our wedding on Sunday Aug 2nd`15. It was perfect. The maracas added so much color to everything.Blanca! I just wanted to say thank you for the beautiful maracas. 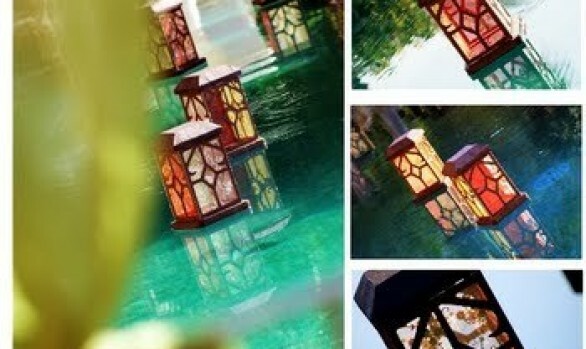 They were a big hit at the wedding and added so much color to our table. They were perfect. 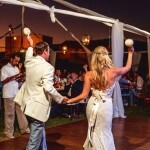 Blanca and Omar, The maracas were a hit for our wedding on Oct. 24 in Cabo! Thank you so much for working with us!! Please use me as a reference any time! Thank you for all you did to add extra flair to our wedding. 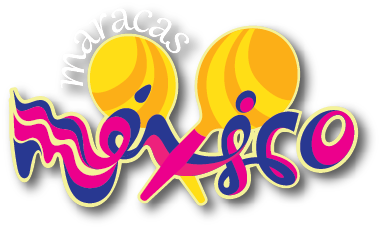 Wanted to give a big thank you to Maracas Mexico for their beautiful handcrafted maraca. They turned out just the way I imagined and followed the colour scheme. They were a huge hit at the wedding for "shake for a kiss". Everyone loved them! 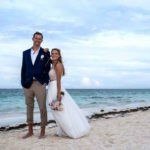 Amanda Rohr & Michael Norton December 3 destination wedding at the beautiful Martoca Beach Garden, Riviera Nayarit Mexico. Thank you my new friends Omar & Blanca of Maracas Mexico for the beautiful maracas, piñata and the Kokopelli lanterns that gave the perfect touch! magnificent time was had by all Also huge thanks to all the guests who helped make Amanda & Michael's day complete & more than they dreamed it could be..!!! Saludos..
We had the best experience with Maracas Mexico! Blanca and Omar (an adorable married couple) run the business and run it very well! 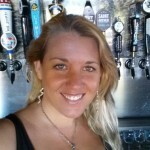 From the moment we contacted them, they were very warm, honest, professional, and seemed genuinely happy to help us. 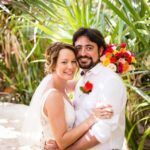 At first we didn't know what design we wanted, but since we were getting married in Mexico (and we're all from the northern US or Spain), we thought - why not do colorful, traditional Mexican decor? So, we opted for lots of different bright colors of maracas, and ended up ordered custom Papel Picado placemats and a piñata, too! 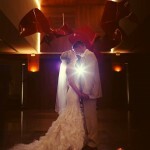 Everything turned out so beautiful and added such "flavor" to our wedding. It was just perfect. 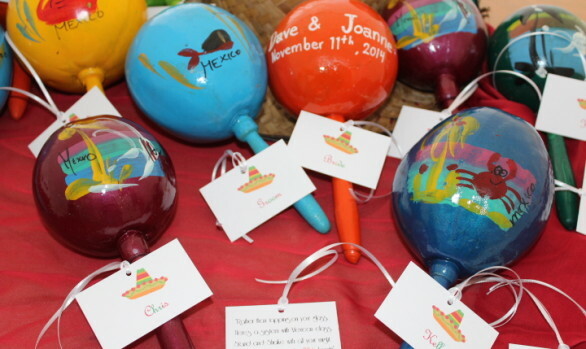 The maracas were placed on the chairs during the ceremony so everyone could "shake for a kiss" once we were married, and then take them home as their wedding favor. What a great souvenir! 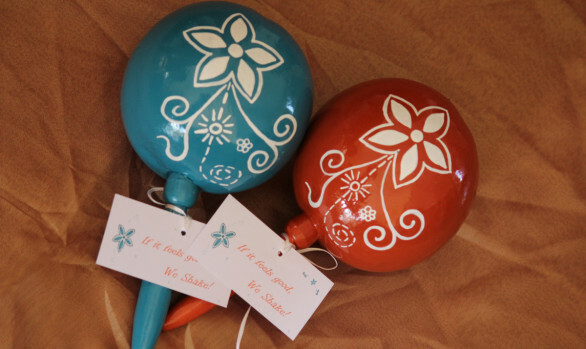 The quality of the maracas is VERY high - they're made from a fruit in Mexico, sanded, the handle is added, and then painted. 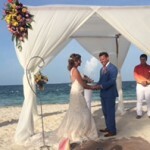 It´s a real, authentic little piece of México that we have to always remember our amazing wedding in beautiful Mexico. As an added bonus, they shipped everything for us DIRECTLY to our resort so we didn't have to worry about it! So easy! I had looked at other vendors here in the States, but I'm so happy that we went with Maracas Mexico. 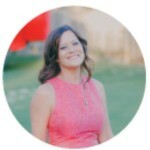 Not only did they provide us with beautiful, authentic, traditional, quality decorations for our wedding at a very fair price, but they are an incredibly sweet couple who really cares about their customers! Muchas gracias, Blanca y Omar!